The ending of Kiss Me Deadly (1955) has been a center of debate among its fans and critics, while the authentic ending is now in place and the alternate one is offered as an extra. As Gabrielle opens the Pandora’s Box, she is exposed to the bright light of the Hell, detonating the ultimate Doomsday device. In physics, that bright (blue) light is actually called Cherenkov radiation, and anyone who sees it too closely will die a horrible death. Intense light, including Cherenkov radiation, is created by critical state of nuclear materials, emitting enormous amount of nuclear radiation, such as alpha, beta and gamma radiations. Then, in the case of ”Kiss Me Deadly”, how much radiation are we talking about? JCO, nuclear material processing plant in Japan, had a serious accident in 1999. The accident claimed three fatalities and more than 600 people exposed to alarming level of radiation. One of the victims was the worker in Uranium enrichment process. Under the horrible practice measures and almost criminal internal safety regulations (or lack of it), he was using an ordinary off-the-shelf bucket to transfer Uranium solution (uranyl nitrate solution, to be exact) to the vessel. He saw the intense blue light. He died a month later. I read the whole slow process of his demise, and I really cannot describe it here. Nobody should experience such a death. The level of 17 sieverts (Sv) was reported to be his exposure (Sv is the unit for radiation exposure). He must have received that much level of dose in matter of minutes. It is commonly believed that 10 Sv causes the death in less than 2 weeks (some says 7 Sv means instant death). 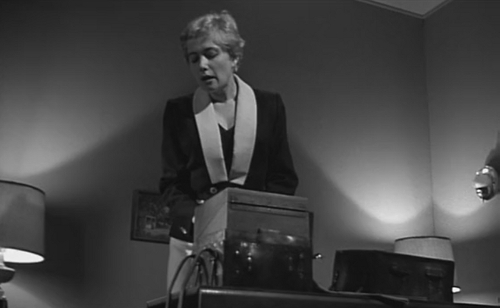 Considering that, Gabrielle in Kiss Me Deadly must be exposed to at least that level of radiation. Not only that, that Pandora’s Box blows up, so Mike and Velda are exposed to almost same level of radiation in no matter which ending version. I don’t think they would survive more than a few days. In Fukushima Dai-ichi Plant, more than 10Sv/h was observed near the failed reactor No.1 and No.2 buildings (their device was not able to measure radiation levels more than 10Sv/h). Probably spending more than a few minutes in that area will kill you. In another words, we have three or four ”Kiss Me Deadly” beach houses there. D.O.A. 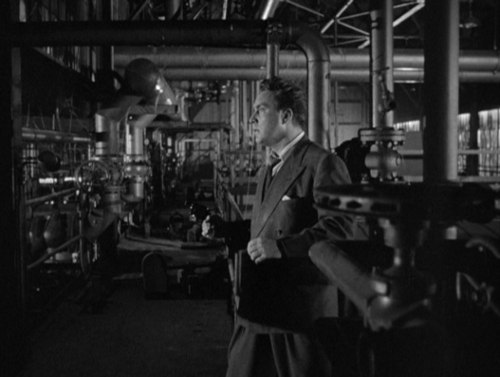 (1950) is another film noir with nuclear twist. Bigelow was poisoned with “the luminous toxin”. The film’s credit says it is a “descriptive term for a real poison”, nothing more. But Majak and Halliday were dabbling iridium, isotope of which is radioactive and emits gamma-ray. Luminosity of the poison, criminal export business with shady foreigners and exotic element as a plot device all suggest that producers of the film expected audience would infer the poison in question is radioactive. I seriously doubt if the local medical doctors were able to diagnose such an exotic poison in matter of hours in 1949, but it was a good paranoiac device to drive intense narrative. Then, how much of poison are we talking about? In 2006, the journalist Alexander Litvinenko became seriously ill from polonium poisoning. Somebody must have slipped incredible amount of nuclear material into his tea. The problem with polonium is that it only emits alpha radiation, which is hard to detect. In the end, Litvinenko died three weeks later. His dose was estimated at 2G bequrels (Bq, another unit for nuclear dose, G stands for giga and 2 GBq =2,000,000,000 Bq). So it is reasonable to assume Bigelow in D.O.A. was poisoned in the dose of that order or more. Most of the time, your food contains less than 100 Bq/kg (varies from food to food, though). In Japan today, the upper limit for radioactive materials in food is set to 500 Bq/kg for vegetables and meat. A few days ago, TEPCO announced that it had accidentally discharged 150 tonnes of highly contaminated water in Fukushima Dai Ichi into ocean. The estimate of dose is total of 26 G Bq (= 26,000,000,000 Bq). A school of Bigelow fishes must be frantically swimming around to find their killer, ”We were murdered!”. I hope they end up in TEPCO’s Executive lunch dishes so that they can avenge their agony. Because of immense amount of contaminated water, TEPCO was planning to release more water in the future (but retracted it).